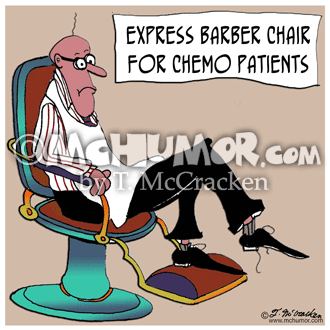 Cancer Cartoon 8322: An almost bald man sitting in an "Express Barber Chair for Chemo Patients." 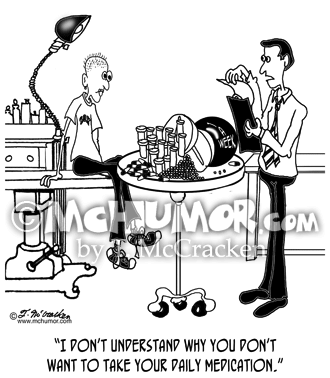 Cancer Cartoon 8327: A woman walking by a hospital reads a report, oblivious to a piano that's about to fall on her. 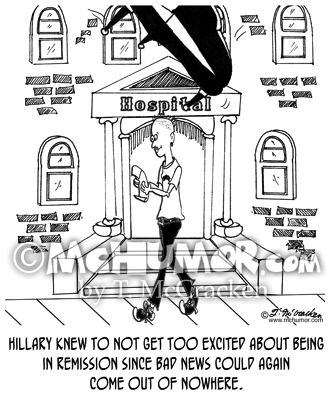 "Hillary knew to not get too excited about being in remission since bad news could again come out of nowhere." 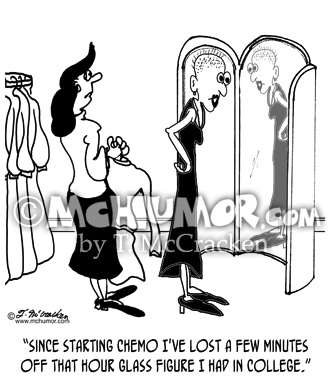 "Cancer Cartoon 8342: A very skinny cancer patient trying on a dress looks in a mirror and says, “Since starting chemo I've lost a few minutes off that hour glass figure I had in college." 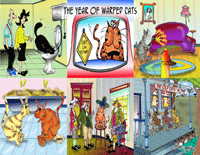 Cancer Cartoon 8352: "Pole Dancing on the Chemo Ward." 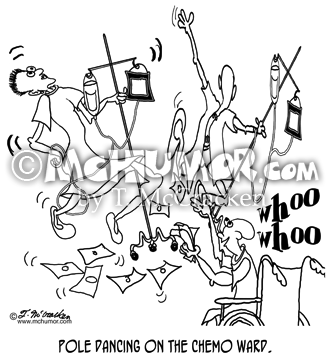 A couple of patients in hospital gowns dance with the poles their IV bottles hang from while one in wheel chair throws money at them and saying, "Whoo Whoo." 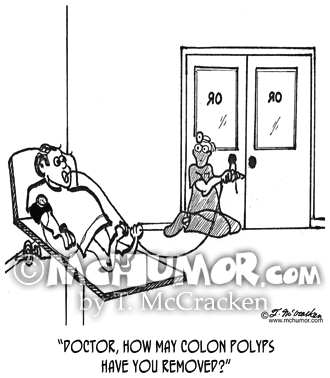 Cancer Cartoon 8370: When a cancer patient's eye balls pop out and roll across a doctor's office, the doctor says, "Oh dear. 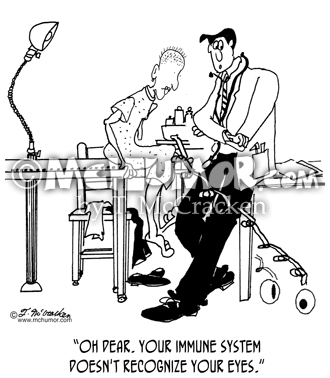 Your immune system doesn't recognize your eyes." 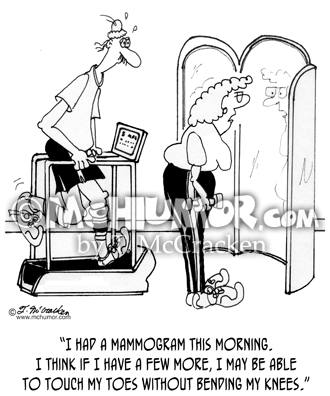 Mammogram Cartoon 8143: In a gym a woman with sagging breasts says, "I had a mammogram this morning. 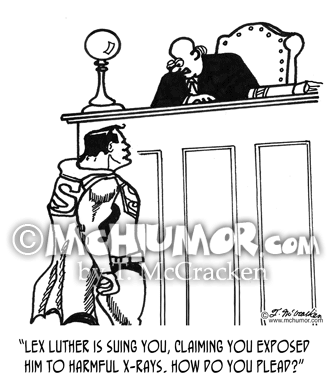 I think if I have a few more, I may be able to touch my toes without bending my knees." 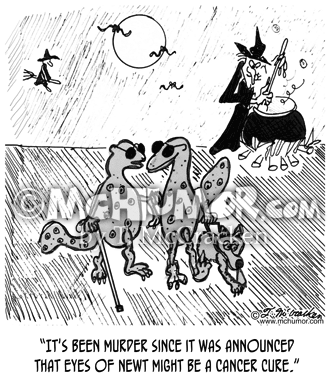 Cancer Cartoon 2508: A lizard with dark glasses a white cane and a seeing eye dog says to another, "It's been murder since it was announced that eyes of newt might be a cancer"
Disease Cartoon 8895: In a petri dish a cell aims a gun at other cells. 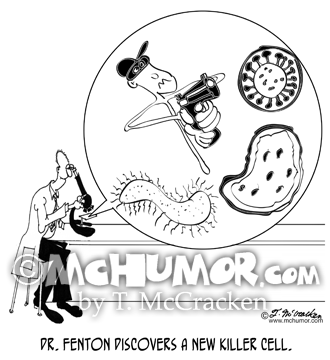 "Dr. Fenton discovers a new killer cell."